OK, this is now getting fun. I see snow on the ground, so it has to be somewhere cold enough in July to hold that kind of precipitation. I don’t believe there is much snow in anything habitable or urban right now in Europe, which would be my first guess given the architecture (new and old) and bullet-spangled buildings. So I want to shift to the southern hemisphere as I do not believe this is anything Himalayan or former-Soviet. There is only one country I can think of with similar architecture, flora, and weather and that is South Africa. I’ll go with Cape Town. The snow on the ground eliminates a lot of possible locations (it ain’t Africa, Iraq, Lebanon, the West Bank, etc. ), and the location is hilly as well. I have to think it’s in the former Yugoslavia, and I’m going to go with Pristina, Kosovo. Grozny, Chechnya? Looks like heavy gunfire pretty recently with time to rebuild. Snow on ground shifts time of year from present, but that’s my guess. in South Ossetia. My initial guesses (based on the bullet-ridden wall) were Kosovo, Chechnya or South Ossetia. The buildings suggest Eastern European/Caucuses-region architecture. There are a few modern apartment complexes in view, so I discounted the possibility that it would be Chechnya (which was heavily damaged and impoverished after the conflict). The fact the main building still remains damaged suggests that any conflict was recent (so discounting Kosovo). The only town in South Ossetia that could be as built-up as this picture suggests is Tskhinvali. Tskhinvali? Obvious bullet holes first made me think of Africa, then I saw the snow. The buildings seemed to represent Georgia better than the Balkan damage of the last decade. P.S. I’m not just participating for a copy of the book; I teach 7th grade Social Studies and have offered a reward if any of my former students wins the contest before I do. So my reputation amongst “my minions” is at stake. I was going to guess the Republic of Georgia, but something made me change my mind. I’m going to move a little westward and guess Turkey. The picture brought to mind the novel “Snow” by Orhan Pamuk, so I’ll go ahead and guess the city that the novel takes place in: Kars, Turkey. Can’t wait to find out I wasn’t even on the right continent. This is a depressingly common sight in Croatia and Bosnia fifteen years after the last shots were fired, too common for me to make anything more than a wild guess of which town or city this house stands in. Unfinished three- or four-story houses are another all-too-common sight in this land of big dreams and poor planning. My guess is Karlovac, Croatia. Tropoje, Albania? Clearly European architecture. Impacts indicate ordinance less than .50 cal. The size and disposition of the houses indicates a city less destroyed than one would expect in Chechnya, and greater in population than what one finds in South Ossetia. I don’t think the caliber weapons and the type of engagement indicated thereby fit with either of those either. Tropoje is a guess based on the assumption of a conflict related to Kosovo. My best guess is somewhere in Bosnia & Herzegovina. Sarajevo fits the bill, but that is too obvious. You like your views a little wonky. Tuzla was a major flash-point in the ethnic wars of the former Yugoslavia and very close to Serbia, making it my best guess. Srebrenica immediately came to mind when I saw the photograph, so this a gut-feeling guess. Because everyone and their mother is going to guess Sarajevo, I’m going with Germany, East Berlin. So we’re clearly in the Balkans, and either in Kosovo or Bosnia – Dubrovnik and Osijek (the main Croatian towns that might still have war damage) would not, I’m guessing, have this kind of dense modernist residential area. 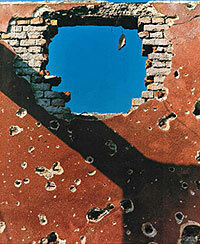 A Google search for “bullet holes Sarajevo” returns this photo of a mortar-damaged wall, taken in 1997 by Masaki Hirano, that has the same colour paint as the wall in the contest photo. Photos of Pristina suggest different architecture (also, the fighting in Kosovo lasted for a much shorter time, making it, I guess, less likely that there would be extensive damage to non-strategic residential areas – no siege, so no entrenched front lines). 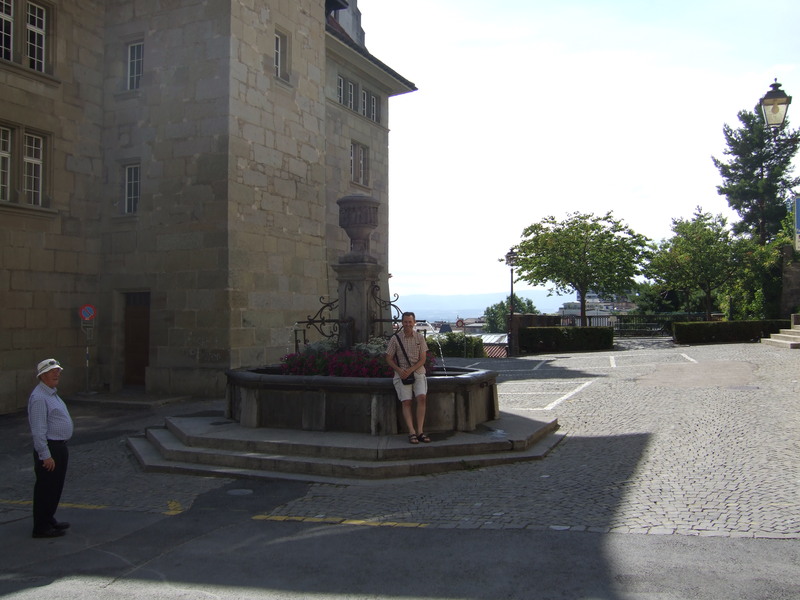 Then, with a little more digging, I found this photo – of the same building, taken from a different angle. Unfortunately, the blog post isn’t entirely clear where it’s of – could be Sarajevo or Mostar – but based on the Hirano picture, I’m going to go with Sarajevo, Bosnia as this week’s answer. 3) Julia Roberts appeared alongside Kevin Bacon in the film Flatliners, also released in 1990. Gotta be worth a try, right? Sarajevo? This is the best I’ve felt so far regarding the contest, but there is no way I can compete with folks who actually travel to or google map the exact location to the actual coordinates. Gosh, you would think Dish readers could find Bin Laden if you made it into a contest! This is clearly from one of the war-torn countries of the Balkans. I was in Bosnia last summer, and this photograph definitely remind me of Sarajevo, where the “Sarajevo roses” – holes in the sidewalk from mortar shells that have been filled in with red paint – are next to gleaming new buildings, which in turn are side-by-side with buildings covered with bullet holes, even to this day, 15 years after the war ended. The bullet holes in the concrete wall make me think of this video of Russian dissident, writer and crackpot Eduard Limonov hanging with accused war criminal Radovan Karadzic and firing rounds from a sniper rifle into Sarajevo. So that’s my guess.